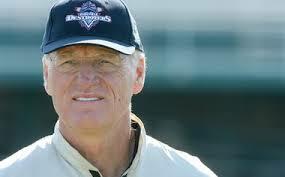 I just found out today is Marty Schottenheimer’s birthday. He is 72. Knowing this makes me happy, because I got to cover Marty, a football coach who presided over 200 NFL victories, as a local sports writer a few years ago when he worked in Virginia Beach. I liked him a lot. I didn’t come to my interaction with him, as coach of the dearly departed Virginia Destroyers of the now-defunct United Football League, with the bias of fans burned by ill-fated games during his head coaching tenures in Cleveland, Kansas City, Washington or San Diego. In a put-up or shut-up world, his legacy isn’t the best because Marty never coached a team to the Super Bowl, which is why he is the only coach with 200 victories who isn’t in the Pro Football Hall of Fame. I just went in with the idea that it could be really cool to deal with a coach of such renown – hey, that’s Marty Damn Schottenheimer – and talk football. I was interested to learn why he was slumming in a startup pro football league destined to fold. Misting up, he told me a story about wanting his young grandchildren to see him do what he was famous for doing — coach football players. He didn’t tell me he’d signed a million-dollar contract that later wound up in court for non-payment. Business is business, sure, and I of course knew he was cashing in on a league desperate to create buzz. But once he was here, it truly seemed much more than that for Marty. He and his staff coached ‘em up hard. The Destroyers won the championship the only year he coached here, his only title as a pro coach. He connected to his players, all of them many decades younger, with old-school appeals to their pride and team spirit. Anyway, my point is Marty was as genuine as any authority figure I covered over three decades. It wasn’t faux sincerity, either. He is the real deal, salt-of-the-earth from near Pittsburgh. Bill Cowher the ex-Steelers coach swears by him. And more than once, he told me to please stop in to see him and his wife. Pat, whenever I was in Charlotte, where they live. That hasn’t happened. But I don’t doubt he meant it, nor that these years later, he would welcome me with a man’s-man handshake and happily reminisce about his one curious year in Virginia Beach. I hope Marty had a happy birthday. Brother, I always enjoy pickin’ up what you’re puttin’ down. Well said, per usual.